If you had told me a year ago, that I would be a regular attendee of the Historic Review Commission meetings for the City of Pittsburgh, I probably would have laughed out loud. In high school, I had an English teacher tell me I would never write an A paper. So I stopped writing and reading and spent all of my time in math and science. To the surprise of everyone, including our teacher, my team won second place in the Chemistry Olympics. It is still funny to me that I now spend a lot of time writing. And I’ve come to understand that I really love history, especially the industrial history of the City of Pittsburgh. I once, very briefly spent 2 days thinking I would move to Boston for a job. The job wasn’t the right one for me, but I also just couldn’t get into all of the colonial history of New England. If you have been a long time reader of IheartPGH and/or a regular follower on Twitter, first of all, thank you, every reader, every comment, like and retweet is way better than an A on an english paper. You may have noticed that I have been writing and tweeting about the Albright United Methodist Church building. This grand old church sits at the corner of S. Graham Street and Centre Avenue (486 S. Graham Street), next to the Wendy’s and the building that now is a mattress store, but if you spent your high school years in Pittsburgh’s East End you are likely to remember it as the other Blockbuster Video. Last fall, I nominated the Albright Church building for historic designation in the city of Pittsburgh. On February 2nd, the Historic Review Commission met and determined that the nomination will move forward. 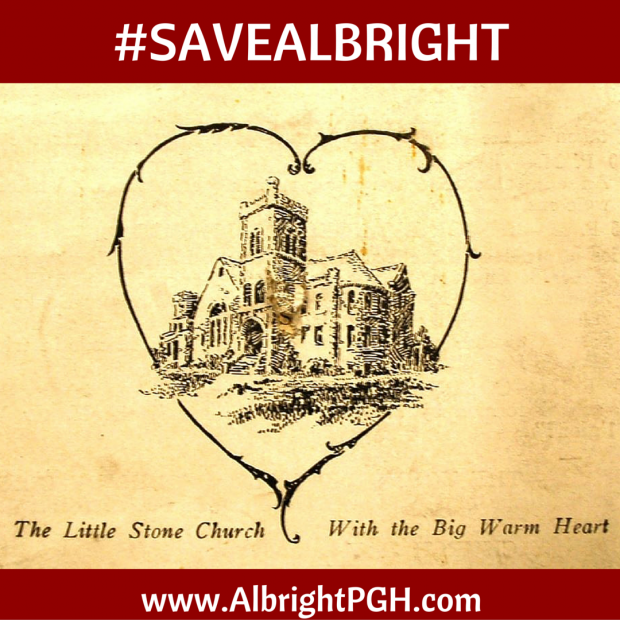 You can read more about the February 2nd hearing in the Post-Gazette -“Preservation fight begins for Albright United Methodist Church in Bloomfield” (February 4, 2016). Next week is the public hearing on the historic designation for the Albright Church Building. Please help me make sure this building stays in our city for another 110 years by attending the public hearing on Wednesday, March 2, at 12:30 p.m., at 200 Ross St., on the first floor, and by signing the petition showing your support for historic designation of the Albright Church building. Send the Historic Review Commission a letter of support (sample letters and details here). Sign the petition & share with your friends!http://bit.ly/AlbrightPetition. Built in 1906, the Albright church building will turn 110 years old this year. The building was designed by architect Chancey W. Hodgdon. The stained glass windows in the building are one of the best examples and most complete collections of stained glass created by the SS Marshall Glass company, which was located on the North Side. The building located at 486 S. Graham Street has the original corner-stone from the previous church building, which was located downtown before the congregation moved to the East End. These are just a few of the reasons this building should be nominated for historic designation. Read more about the history of the Albright Church building the East Liberty Valley Historic Society’s fall newsletter here. Read the entire historic designation application for the Albright Church building here. Plaque commemorating the previous church building. Article from June 6, 1906 about the opening of the church. I have nominated this building for historic designation because I care deeply about the fabric of our neighborhoods. There was a point in time where these churches were used for much more than a worship space on Sunday mornings. Churches and settlement houses provided activities, meals and services for their members all week long. Many churches offered preschool classes and recreational spaces. Before we shutter these buildings, and in many cases tear them down, might this be the time to talk about transforming these spaces into third places that continue to provide child care, recreations, or many other things that the community needs today. The Albright church is technically in Bloomfield, but sits at the intersection where Bloomfield meets Friendship and Shadyside. This is the ideal location for a community space that can serve multiple neighborhoods and populations from students to seniors. We have an exciting opportunity to preserve this building and to transform this space into a space that continues to serve our community. Union Project – located in Highland Park, this building now houses and arts program, office space and is rented for a variety of community events. Neu Kirche – located in East Deutschtown, this church was built in 1889 and now house a contemporary arts center. 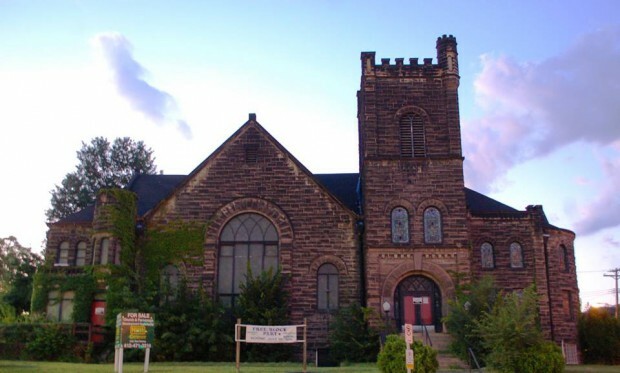 Calvary United Methodist Church – the Allegheny Historic Preservation Society is a group of neighbors that has successfully raised millions of dollars to support the preservation and restoration of this church. Mr. Smalls – former church in Millvale has been re-purposedas a music venue that attracts artists from around the globe.